Supporting the arts and championing creativity in London. Bow Arts’ mission is to support community renewal in London by delivering arts and creative services. They operate artists’ studios in various sites around East and South East London. Their education programme has taken world-class artists into schools across London, which has improved the lives and learning of thousands of children and young people. For five years we've helped Bow Arts communicate their message to their varied community. Bow Arts was established in 1995 by Marcel Baettig, and soon after they moved into their Bow Road premises and started providing artists’ studios on the site. When we first met with Bow Arts, they were moving from their previous identity as Bow Arts Trust, and were aiming for a more informal and accessible brand. They were becoming more public facing, and needed a brand and web presence that reflected that. We support Bow Arts to deliver effective design. Like any charity, it's important that what we deliver is cost effective, sustainable and their in-house team can continue to independently use what we produce. We developed the Bow Arts brand with the goal of "having a strong and contained presence". Bow Arts has a far-reaching network, and it needed to be recognisable on a wide variety of media and the partner projects they participate in. The bright pink circular Bow Arts "stamp" has proven to be a very eye-catching and a recognisable icon appearing on t-shirts, badges, tote bags, hand painted signs, marquees and across their various studio sites. To reflect the broad work that Bow Arts complete we also created sub-brands for The Nunnery Gallery, Education and Studios. The diversity of Bow Arts projects always means there's a challenge to be met. It could be a designing a giant installation of laser cut poetry that will be displayed in a school Library, or designing a set of postcards that demonstrates the value of their education programme. We built bowarts.org as a mobile-first, fully responsive CMS site powered by Drupal. The goal was to clearly present the varied work that Bow Arts completes. There's a dedicated design for each of the sub-brands, further helping to differentiate between the information presented. Bow Arts also founded two websites, which Wired Canvas has helped them develop: London’s Artist Quarter and Artist's Studio Finder. London’s Artist Quarter is a community-led, heavy-traffic showcase for local artists, events and opportunities. It includes an extensive events listings calendar, as well as a vast directory of the many artists living and working in East London. It is powered by user-submitted content, allowing users to upload and showcase their work. Artist's Studio Finder is an online search facility listing available studio spaces in London. It allows users to register and submit their own studio listings. The site is so popular with artists that it's starting in other regions of the country. 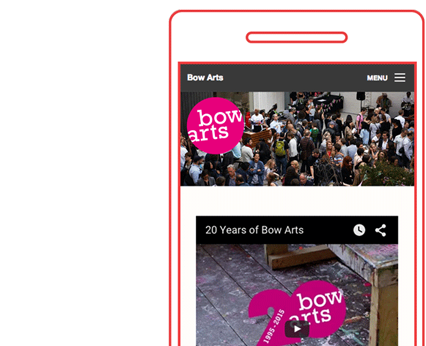 The new responsive Bow Arts website loads 25% faster than the previous site; meaning that it works significantly better on mobile devices and weak internet connections. After launching the new mobile-friendly 'responsive' website, we saw an increase of 140% in visitors using mobile devices in just a few months. The website works smoothly across all smartphones and tablet devices, and resizes for all different sized screens.